(This article needs to be updated. But, in short, the Axe Avenge in BBCOR is the lightest swinging bat for 2019). We measured the swing weight of every BBCOR bat. Comparing those numbers with the available sizing options, the lightest BBCOR bat in 2018 is the 29/26 Louisivlle Slugger 618 Solo. 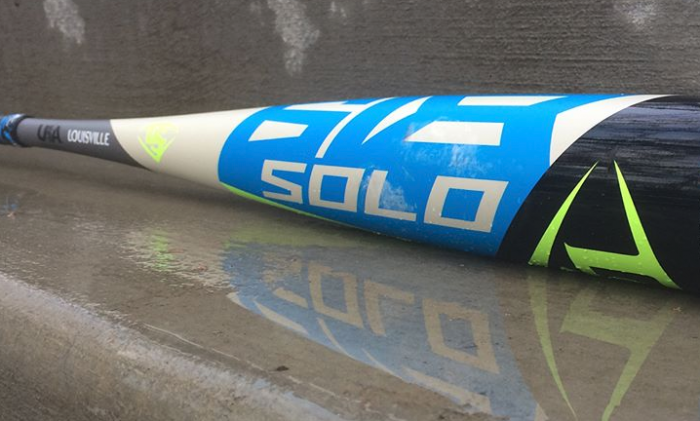 The Solo swings 9.5% lighter than the average BBCOR bat in any particular length. (The 618 Solo comes in sizes from 29 to 34-inch). We also found DeMarini’s Voodoo One Balanced a comes in a close second (although it lacks a 29-inch. Easton’s Z-Core Speed and Slugger’s Omaha 518 also have a 29-inch version that swings very light (compared to 30+ inch bats). The lightest swinging two piece is DeMarini’s CF Zen. Scale Weight is NOT one and the same with swing weight. Swing weight is what matters. And in terms of swing weight, the easiest bat to swing in the 2018 class of BBCOR bats is Slugger’s 618 Solo. In part because it has the lightest swing in each length compared to other bat’s of the same length. As well, because it comes in a 29 inch too. Price check: Amazon.com. Every bat on this list we would recommend. But, only some come in a 29-inch. The 618 Solo is one of them. (Also, the Easton Z-Core Speed and Omaha 518 do too). If you are truly looking for the LIGHTEST swinging BBCOR bat then the 618 is it. And it is a great bat, too. (See our full 618 Review). However, if budget wasn’t an issue, we’d try and convince you to upgrade to a 30″ BBCOR Ghost X or CF Zen from Easton or DeMarini. Smaller players will really appreciate the bigger barrel profile as well as the smoother feel on hits and mishits. Do note, however, a 30″ Ghost X or CF Zen is 12% (or so) higher than the 29-inch 618 Solo. (See the DeMarini 2019 CF Zen Review). Per length, the 2018 Voodoo One is the 2nd lightest 2018 BBCOR bat. But, it’s shortest size is a 30-inch. 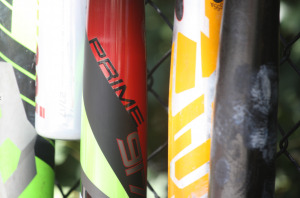 Other bats, like the Easton’s Z-Core Speed, Slugger’s 518 and the 618 Solo come in a a 29-inch. Each of those 29-inch bats are lighter than the lightest 30-inch Voodoo One. But, in the 30 to 34-inch (which is what the Voodoo One is produced in) it is the 2nd lighest BBCOR bat. Price check: Amazon.com. BBCOR standards require a minimum swing weight. In other words, a manufacturer cannot make a bat as light as they physically can. There is no maximum swing weight requirement. Still, though, BBCOR bats are well spread out, starting at the minimum, and moving up about 15%. The Zen and Easton Ghost X are very close on our swing weight measurements. But our Zen just edged out (in the 33-inch). We’d guess these two bats are within our measuring ability’s margin of error. Both bats are also two piece bats and the lightest two piece bats on the market. Most smaller players looking for as much bat speed as possible (and hence the lightest bat) might be able to take a little more weight if it means their hands don’t sting as much These two piece bats could make it worth your while. Price check: Amazon.com. What Effects Swing Weight More: Bat Length or Scale Weight? The answer to this is longer than the paragraph or two we’ll give it here. But, in short, both effect swing weight just about equally. In finding the lighter of two BBCOR bats, the one with a shorter size will almost always have a lower swing weight. The drop is the numerical difference between the bat’s length in inches and the bat’s weight in ounces. For example, a 32 inch bat with a drop 3 weighs 29 ounces. All BBCOR bats are required to be a drop 3. There is some allowed variance in the scale weight. With the advent of USA Bats in 2018, a few leagues allow players to swing either a BBCOR or USA Bat. Since the performance standard is virtually the same, the idea is there is no trampoline advantage to one or the other. Leagues that allows are usually tailored to the 13 to 15 year old market. To find the ideal bat weight, we suggest you check out our bat sizing chart which is based on total weight. As a general rule, though, right bat size weight satisfies two conditions. The first is the player’s max swing speed is not brought down. The second is that the bat weighs as much as possible. Amazingly, BBCOR bats rarely (if ever) come in lengths shorter than 30 inches (i.e. weights less than 27 ounces). In fact, several don’t come in anything shorter than a 31 inch and even some in a 32 inch (like our favorite favorite 2018 BBCOR). Admittedly, end loaded bats may rarely find a home in a short size. Players looking for something short are often looking for as little swing weight as possible. But, why serious bats designed with a light swing don’t often come in a 29 inch length is frustrating, especially if your newly minted BBCOR player hasn’t yet grown. USA/BBCOR combo leagues have solved much of this issue (since USA Bats come in less than drop 3 ratios). We are hopeful more leagues serving that age group will adopt similar policies.